Complete Beginner’s Guide to LocalMonero Review 2019 - Is it Safe? LocalMonero aims to create a safe and simple person-to-person platform that lets users buy and sell Monero using their local currency, no matter where they live. On LocalMonero, users post ads that include their preferred method of payment and then another user responds. LocalMonero serves as an escrow to hold the Monero from the seller in a trade, then releases it to the buyer once the seller confirms receipt of payment. LocalMonero is also available to step in and settle any disputes. The team behind LocalMonero is a group of Monero enthusiasts who live in Hong Kong. This is the ideal location since it is one of the world’s three financial capitals and the freest economy in the world. It is also widely considered to be among the top jurisdictions for those interested in cryptocurrency due to its laws. How Is LocalMonero Different from Other Platforms? 1 How Is LocalMonero Different from Other Platforms? 2 Who Can Use LocalMonero? 4 How Do You Buy Monero with LocalMonero? 5 How Do You Sell Monero with LocalMonero? 6 How Do You Create an Advertisement? 8 What Payment Methods Does LocalMonero Offer? 11 Can You Use Two-Factor Authentication with LocalMonero? 12 What Tools Does LocalMonero Offer for New Users? LocalMonero is vastly different from other centralized and even decentralized cryptocurrency exchanges since you make direct trades with another person instead of trading via the exchange. You deal directly with other humans, something most users strongly appreciate. The fact that interactions are peer to peer also allows for no corporate overhead and a quick process. In other words, fees are minimal, and you don’t have to wait for your Monero to arrive. Instead, you receive it instantly. To add to the benefits, LocalMonero supports all payment methods that the users support, which allows those who do not have traditional banking access to sell or buy Monero. Monero buyers have protection at all times thanks to the transaction and escrow services. Anyone can use LocalMonero to buy or sell Monero with others near them in their local currency. When you visit the website, it automatically detects your location and defaults to display advertisements for buying and selling within your country. 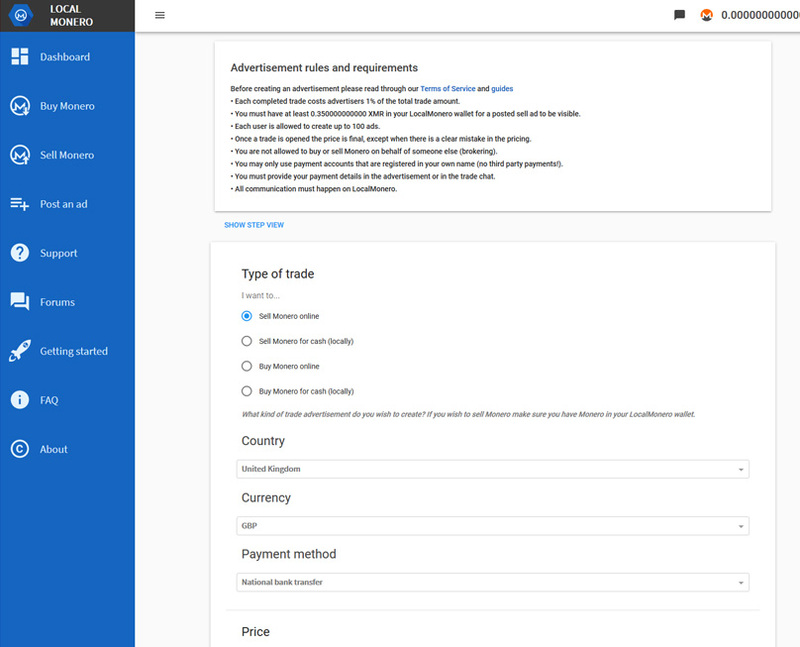 Just below the charts with the current advertisements, you will see a message that reads “Showing advertisements in [your country].” If this is not the country or currency you want to buy or sell Monero in, there is a “Change” button immediately before the statement. Just click the button and start typing in your location; almost everywhere is included. In addition to the option of logging in or signing up for an account, the LocalMonero homepage lets you start a transaction with ease. At the top, you will find a search section where you can look for advertisements to buy or sell a specific amount of Monero. The search section asks you to fill out the amount, currency, country, and whether you want “all online offers” or just offers with a particular payment option. The currency and country default to the appropriate ones for your detected country, or the one you changed the website to. Once you hit the search button, the results will appear, displaying all the advertisements that meet your criteria. 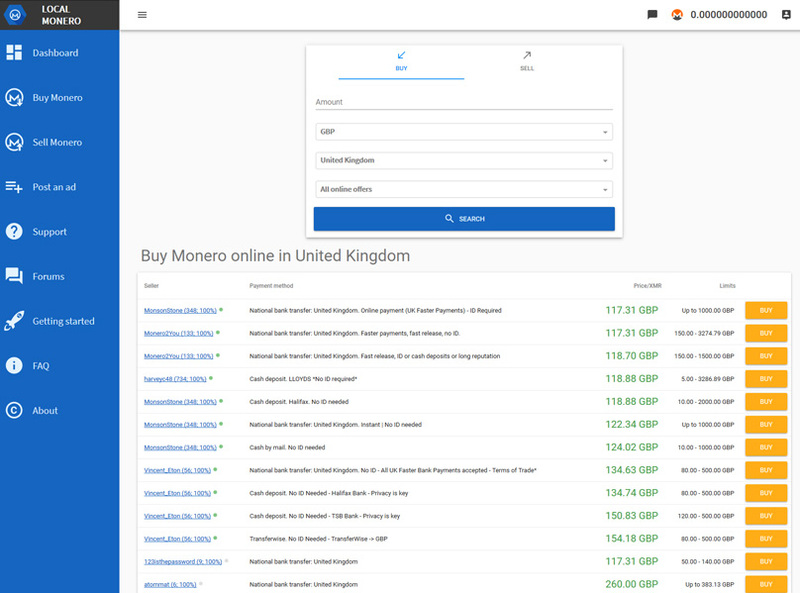 If you prefer, you can also go right below this and just browse ads to buy and sell Monero within your selected country, each divided into online and cash options. The first six advertisements in each category appear, each showing the seller, payment method, and price/XMR (and sometimes limit), followed by a “Buy” button in the case of online ads. 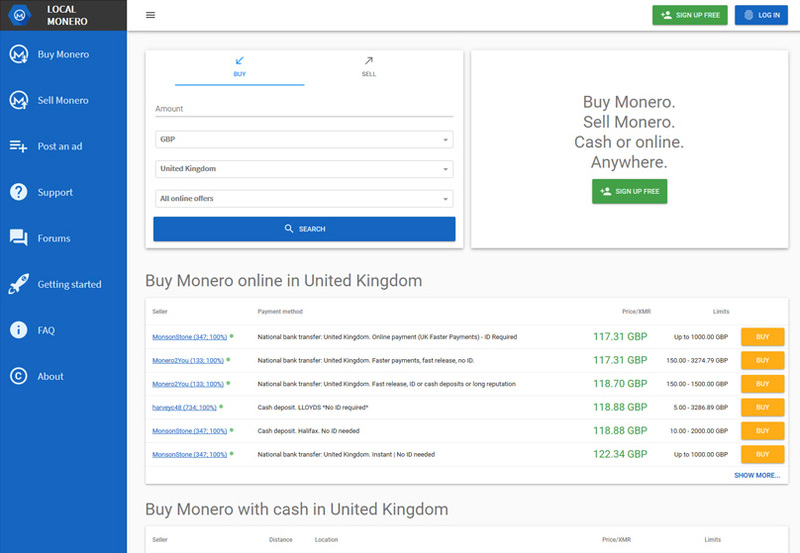 Advertisements for sales in cash have similar columns: seller, location, price/XMR, and “Buy.” Below the sixth advertisement, there is a button to “show more,” which will take you to a page listing all the buy or sell orders for Monero in your chosen country, specifically either in cash or online transactions. How Do You Buy Monero with LocalMonero? Once you select “Buy,” you will see additional information, including the trade terms. Always read the terms before you submit your trade request since if you do not agree, you can choose a different advertisement or make your own. If you agree to the terms, enter the amount of Monero you wish to purchase and hit “Send trade request.” You will have a specific payment window that you must complete the payment during in the case of online buttons. Once you make payment, select “I have paid.” The trader will verify the payment and LocalMonero will release your Monero from escrow, sending it to your LocalMonero wallet. How Do You Sell Monero with LocalMonero? If you wish to sell Monero using LocalMonero, you follow a similar process. You can do so from the homepage, as mentioned earlier. 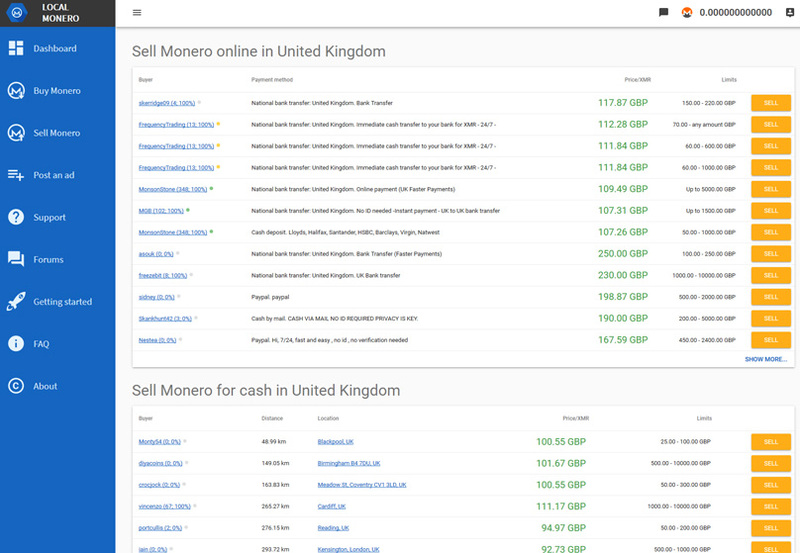 Or click “Sell Monero” from the side navigation bar. This will take you to a page with the search section at the top but defaulted to the “Sell” tab instead of “Buy,” followed by advertisements for selling Monero online and then in cash. 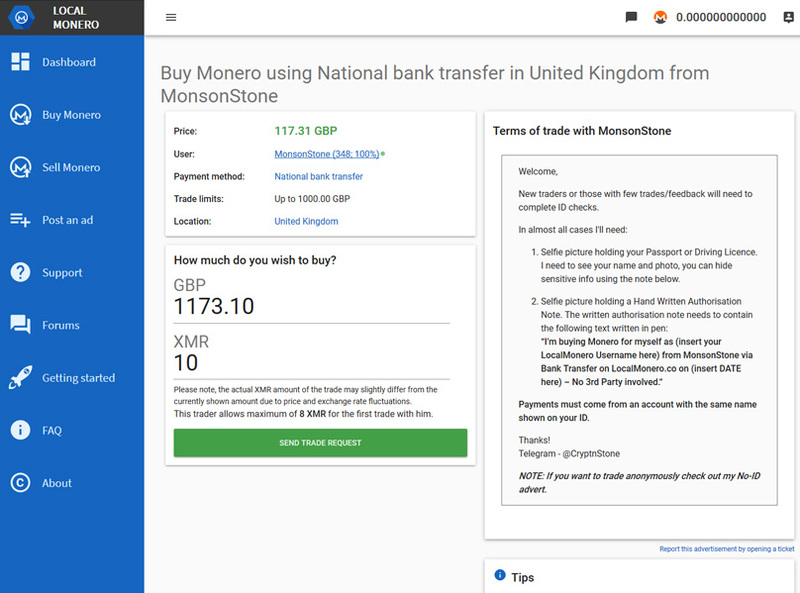 The detailed process for selling Monero online with LocalMonero is nearly the same as buying, but after you submit the trade request, the buyer will ask for payment details, such as an account number. 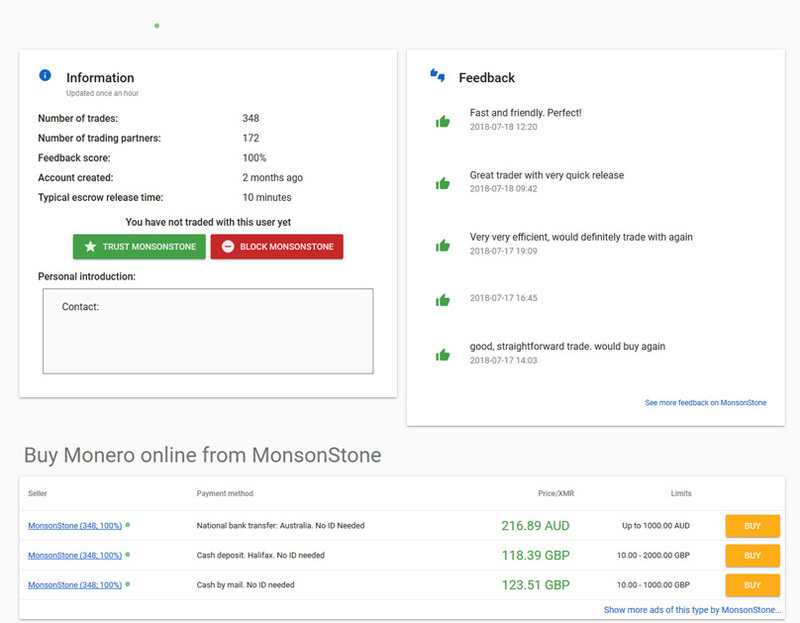 Once you confirm you receive the payment, let LocalMonero know so it can release the Monero to the buyer. How Do You Create an Advertisement? If you do not see an advertisement to buy or sell Monero that fits your needs, you can also make your own ad. You will need to log into your LocalMonero account first. Before creating the ad, you are advised of a few important rules and requirements. You are allowed to make up to 50 ads, and every trade that is completed will cost you as the advertiser 1 percent of the total amount traded. Posted sell ads require you to have a minimum of 0.35 XMR in your specific LocalMonero wallet; otherwise, it will not be visible. Once you open the trade, the price is final without the ability to change it. The only exception is when you make a clear mistake. Ads are not allowed on behalf of someone else, so no brokering is allowed. You also must use payment accounts that are in your name and need to provide the payment details either in your trade chat or the ad itself. To create the ad, start by choosing whether you want to sell Monero online or for cash or buy Monero online or for cash. From there, continue filling out the form, which will also ask you to set a price, your location, and your preferred payment method (in the case of online ads). When you look at the current advertisements for buying and selling Monero, you will notice some numbers as well as a colored dot. The numbers directly following the username indicate the number of trades the user has completed and their reputation. For example, figures reading “(40; 100%)” indicate that the user has completed 40 trades and has a reputation score of 100 percent. Generally speaking, most users with ads either have a 100 percent reputation score or a 0 percent score if they have not yet completed trades. However, the reputation score is important since it makes it possible to stay away from the rare LocalMonero user who has not been ideal in their trades in the past. After the name and the numbers, you will notice a circle that is either green, yellow, or gray. This circle indicates when the user was most recently active on LocalMonero. Green circles indicate the trader was online at some point today. Yellow indicates they were online at some point during the week. A gray circle indicates it has been more than a week since they were online. What Payment Methods Does LocalMonero Offer? The payment methods for LocalMonero vary by location. To give you an idea, the following are some of the options in the United States: cash (locally), national bank transfers, transfers with a particular bank, cryptocurrency, cash deposit, cash by ATM, cash by mail, Serve2Serve, Walmart gift code, Square Cash, World Remit, CashU, Walmart 2 Walmart, MoneyGram, Reloadit, ADVCash, Perfect Money, ApplePay, Western Union, Venmo, credit cards, and more. There are dozens and dozens of choices, some of which are considered riskier than others. There are no fees to register for LocalMonero. There is also no fee if you buy and sell Monero via the exchange from an existing advertisement. If you create an advertisement on LocalMonero, then you will have to pay a 1 percent fee for each trade that is completed. Transactions between two LocalMonero wallets are also completely free. If you make a transaction between a LocalMonero wallet and another Monero wallet, you will have to pay the Monero network transaction fee, which does not go to LocalMonero and is not controlled by the exchange. At any time, you can see what the current Monero transaction fees are from the wallet page. Look to the heading labeled “Outgoing Monero Fees.” This fee comes out of your LocalMonero wallet automatically whenever you send a transaction, so you do not have to worry about it. As a peer-to-peer exchange, LocalMonero has more of a community element than traditional centralized exchanges, as well as their decentralized counterparts. There are also forums to let LocalMonero users truly form a community. The forum is specifically designed for discussions related to arbitrage opportunities, trading, expansion requests, and other Monero topics. 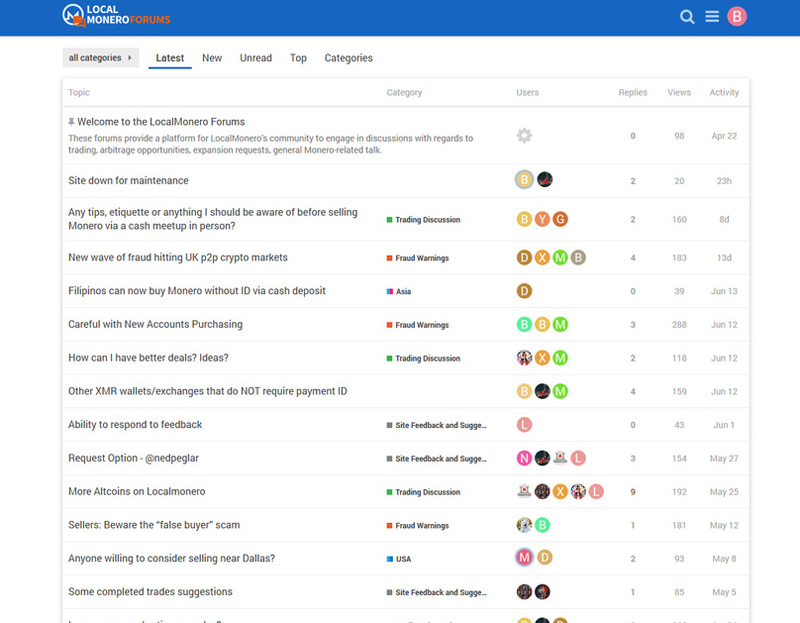 At the time of writing, there were 37 topics, so while the forums are not super active, they do see some activity. Overall, the LocalMonero forums are designed for public, civilized discussions where users can share their knowledge, interests, and skills. There are moderators to ensure no one on the forum breaks the rules, and users can flag bad behavior. The forums also include badges to motivate users to participate. Current topics include questions about usernames, general tips, and scam warnings. Can You Use Two-Factor Authentication with LocalMonero? LocalMonero encourages traders to use two-factor authentication but does not require it. Go to the settings page, then click on the tab labeled “two-factor authentication.” You must write down your backup code and store it in a safe place. 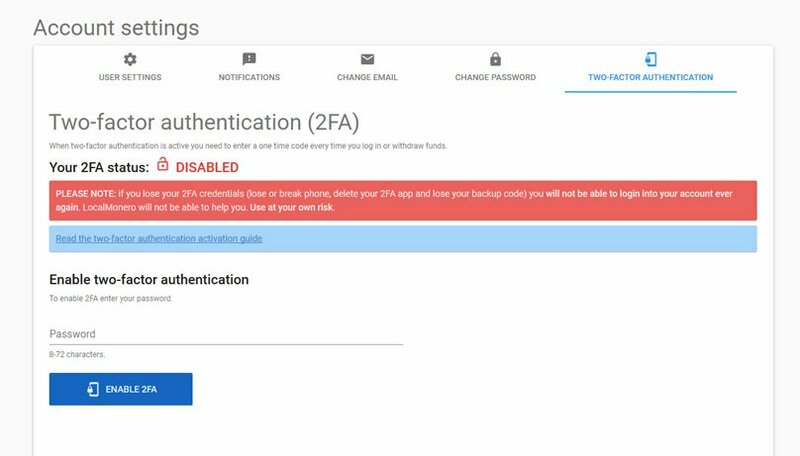 You will need your two-factor code to log in if you delete the authenticator app or lose your phone. LocalMonero uses time-based one-time password algorithm 2FA, which uses an authentication mobile app to send one-time passwords of six digits that change each minute. What Tools Does LocalMonero Offer for New Users? Those who are new to LocalMonero will have multiple resources at their disposal. They are welcome to ask questions on the forum or read previous conversations there for insights. There is also a “Getting Started” section on the main navigation menu. 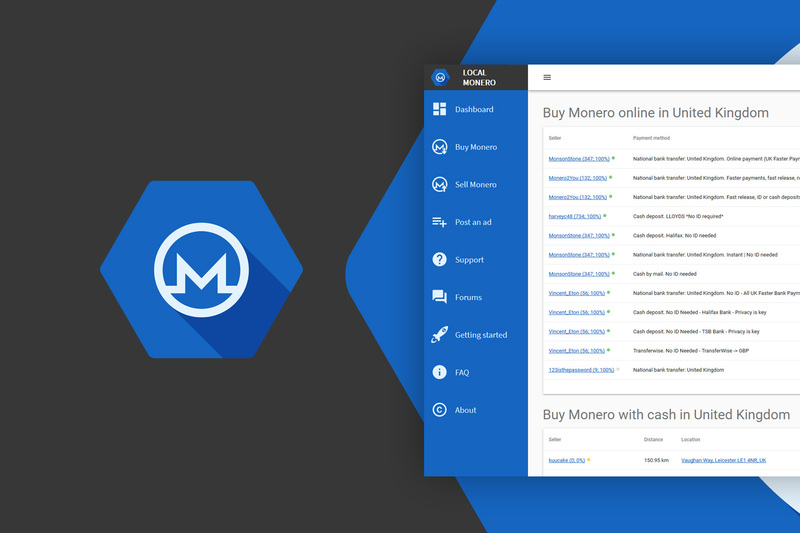 Here, you can find detailed instructions on buying and selling Monero online, as well as trading Monero locally. There is even a section with an introduction to trading Monero in general, plus sections for Telegram mobile notifications and two-factor authentication. With LocalMonero you are not dealing with a centralized exchange, or even a decentralized one but you are trading with other users. Therefore you must exercise some caution when choosing a trading partner, luckily this is easy to do by viewing buyer or seller’s feedback and only choosing someone with a good rating. The website uses an escrow system for exchanging the currency so you should be safe. If meeting up in person to conduct a cash exchange, this is where you should be super vigilant, we would not recommend this method for any sizeable trades as your personal safety can’t be guaranteed. LocalMonero is similar to the famous LocalBitcoins website, connecting users who wish to sell Monero with those who want to buy it, all in the local currency. The exchange facilitates transactions between interested parties and serves as an escrow service to help prevent fraud and scams. LocalMonero is available to users around the world and offers a long list of payment methods to choose from. This is a convenient platform for those who want to start buying and selling Monero or just want to own some of this rising cryptocurrency. this doesn’t explain how to actually pay. how do you know the details of where to transfer the money to? Buah ah ah! Privacy…!? Buah ah ah!